The briefing today was a disappointment, no weather information was given, only a simple “no flying today” was all that was said. Sadly the weather had started to break and was coming in from the North West (low cloud and snow fall). Fortunately, a member of our team needed to go home today (Tam), so we drove the 50min/1hr drive to Salzburg and ventured around the city. It was a surreal experience, with a river separating both the old town and the new town. 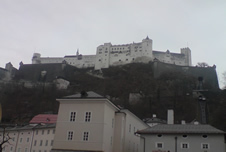 The photo’s below are of the famous castle and Mozart’s birthplace. Although the weather was being unkind to us in Austria, back in the UK our hot air balloon rides in Devon were still flying high! Our team were able to take our customers out for their sunrise and sunset balloon flights, for their magical experience.